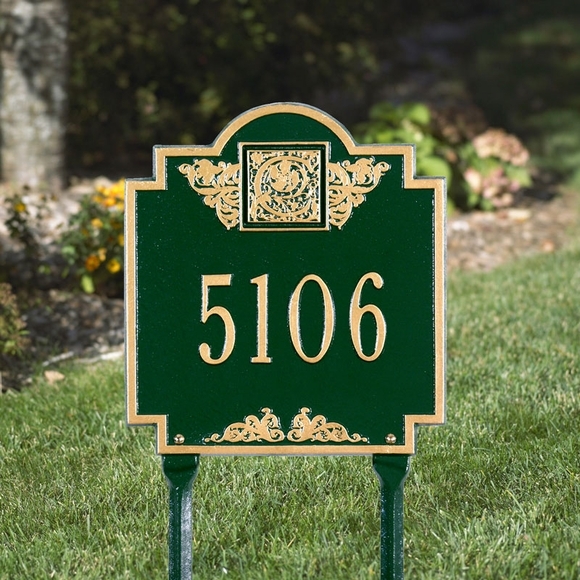 Lawn Mount Address Sign with Monogram - - personalized address sign with two lawn stakes. Made in USA. 10.75" x 11.75" enhanced square shape. The one-line version holds up to five (5) 3" or twelve (12) 1.25" characters. the reverse: up to twelve (12) 1.25" on Line 1 and five (5) 3" characters on Line 2. Click top links in Related Products for the wall-mount version of this sign as well as the 23.25" x 12.25" monogram sign. The monogram is hard to see, wished it was able to stand out more.